Spain taught us you dona��t usually win two World Cups in a row, USA showed us they can move beyond Super Bowl, Germany emphasised the importance of precision, and Luiz Suarez learned that he shouldna��t make a meal of his fellow players. All this will be history come Monday, but we take the frenzy forward to 2018 with our pick of trends, players to watch out for and a low-down on the next hosts, Russia. At the finals at MaracanA?, Rio de Janeiro, do not forget to notice the Brazuca Final Rio, the official match ball. Inspired by the green and gold trophy, the ball has 1.3 lakh followers and it has already met celebrities like Zinedine Zidane, Cafu, Samuel L Jackson and Hugh Jackman. Ita��s probably even a bit holy as it made a trip to Vatican City to meet Pope Francis. The most tested football ever by Adidas, it went through 600 players including Leo Messi, Iker Casillas and Bastian Schweinsteiger. Messia��s portrait haircut by San Antonio-based barber Rob Ferrel created waves and Chiraaj Rao of Skindeep Tattoo Studio tells us that in the past month alone, over 20 clients came in with requests for soccer designs. a�?Ita��s usually logos of clubs as the WC only comes once in four years,a�? enthuses Rao. Artist Pradeep Menon, of Dark Arts The Tattoo Studio shares, a�?The ratio of sport-based art is high, but most of my clients are waiting till the finals before getting inked,a�? Menon shares. Despite the attention they get with their jerseys on, some footballers get more with them off a�� like Cristiano Ronaldo, Lukas Podolski and the Italians. Rohan Menon, of Namma CrossFit, Bangalore, tells you how to get the elusive V-tapered, six-pack abs. a�?For a non-athlete, CrossFit, the Insanity workout and TRX suspension training works. But under 10 per cent body fat plays a key role,a�? Menon advises. So unleash the three-pronged attack on your upper body with lats, deltoid and eternally gruelling abdominal exercises. 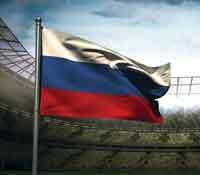 You might be too late for Brazil, but the World Cup 2018 is set in our hemisphere a�� Russia. So, plan your trip to the host cities Kaliningrad, Kazan, Krasnodar, Moscow, Nizhny Novgorod, Rostov-on-Don, Saint Petersburg, Samara, Saransk, Sochi, Volgograd, Yaroslavl and Yekaterinburg well in advance says Sujatha Shetty, owner of Shreya Travels, a popular bespoke holiday agency. a�?Ita��s best you book both hotels and air tickets about a year in advance. Hotels are the best places to stay as language is sometimes a problem, but there are also cosy bed and breakfasts as well as homestays springing up,a�? Shetty tells us, adding that the nine cities have been cleverly chosen in close proximity to help players and fans alike travel with ease while showcasing the best of the nation. She puts the approximate price of travel, accomodation, entertainment and football tickets at about Rs. 4 lakh, minus inflation. Rahul A, an investment advisor, says that the best way to go about saving up is by setting aside money in a recurring account to reach a target of about Rs. 5 lakhs in 2018. a�?Even without interest, if you just put aside Rs. 10,000 each month youa��ll have Rs. 4.8 lakh for the next WC,a�? he tells us, explaining that if you are willing, then bigger returns will come from investments that are high on risk. a�?Another option, though not a very wise investment decision, is to take a personal loan,a�? Rahul shares, warning us of the high interest rates that will accrue. We however advise scanning the web for contests that will send you there for free, when the date draws near! With plenty of field action, from last-gasp goals to controversies, advertising websites like MediaCom and Opta have been tracking player sponsorship. Neymar tops the list, followed by Germans Thomas Muller and Toni Kroos, with Lionel Messi in 12th position. The rankings are based not only their performance but the number of people who watch them. Among brands, Coca-Cola, Nike and Adidas lead the chart for mentions during the WC. In team power rankings, Brazil and Germany lead, although the latter is sure to pip the host, after the 7-1 showdown. 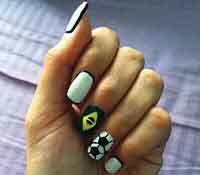 Nail art has cropped up as an easy and creative option to don the colours. a�?We started the trend here before the WC began and it has really caught on,a�? says Beena Sondhi of Visage who familiarised her staff with images of flags and jersey numbers so they had a clear understanding of the concept. a�?But apart from standard motifs, everything is customised,a�? she tells us. From countries to player initials, you can get as creative as you dare with this acrylic-based art that is easy to remove even if your team gets knocked out. According to Skyscanner, a globalA� travel search site, 49 per cent of Indians were supporting five-time champions Brazil, while Argentina and Germany share second spot with 15 per cent, and seven per cent siding Oranje. As for players, King of Dribbling, Lionel Messi is not just leading Argentina but has 38 per cent of the women voting for him to be the hottest footballer of the season. 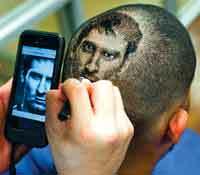 WellA� known for his iconic hair styles andA� tantrums, Cristiano Ronaldo comes second in the list. Brand manager, Debjyoti Mitra Roy, of traffline.com says, a�?For those aged 20 to 35 in metros, our poll showed they wanted to travel to Mumbai, Delhi and Bangalore to watch it live,a�? adding that Underdogs Sports Bar and Grill in New Delhi, The United Sports Bar and Grill (with Indiaa��s largest screen), Monkey Bar and Xtreme Sports bar in Bangalore were the most desired locations in the country. If therea��s one fashion trend to take away from Brazil, ita��s got to beA� the neon boots. Sparking off a rage with far reaching effects, this year the footballers turned out in varying shades, and pairing bright orange with blue or yellow. a�?When you have such strong, manly legs, like the footballers do, why not draw attention to them with bright shoes,a�? says designerMichelle Salins about the neonA� fever. Though she hasna��t been bitten by the bug yet, shea��d definitely pick up a nice pair of flashy footwear if she comes across it. a�?I know I will wear neons well so why not get in on the action!a�?